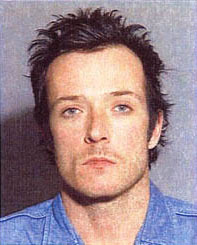 Scott Weiland started performing punk in California's Orange County at age 15. Purportedly met bassist Robert DeLeo at a Black Flag concert, where they discovered they were both dating the same woman. Jamming with drummer Eric Kretz and DeLeo's brother Dean, they called themselves Mighty Joe Young from 1990-1992. Then, while recording their first album, lawyers discovered the name Mighty Joe Young was already trademarked, and the group renamed itself Stone Temple Pilots. Weiland's arrests include heroin (1998), probation violation (1999), wife-beating (2001), heroin, cocaine, and drugged driving (2003). Stone Temple Pilots "fired" their drug-addled frontman in February 2013, though it was never quite clear what that meant. He also sang solo, was briefly in a band called the Magnificent Bastards, and served as lead singer for Velvet Revolver and the Wildabouts, until his death from an overdose of cocaine, ecstasy, and alcohol in 2015. Words to live by: "Atrophy and gangrene are the enemy."